Brief update: management failed to show up for the tripartite meeting today (Saturday, July 24, 2009), saying "Talks would be meaningless unless violent acts are halted." 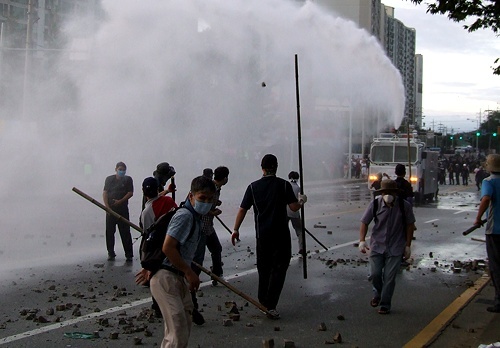 The hypocrisy is made clear by non-stop attack of helicopters dropping toxic liquid teargas on the strikers. 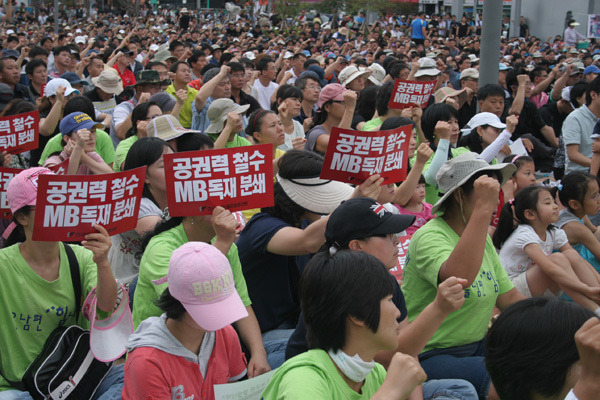 In Pyeongtaek a solidarity rally took place today, with pitched street battle between demonstrators and riot cops. More details coming soon. Police spray liquid tear gas on a piece of Styrofoam in an attempt to demonstrate its harmlessness at the Sports Complex in Pyongtaek city, Gyeonggi Province, July 24. After the Styrofoam melted, the police modified their previous statement and said, "Although the Styrofoam melted, the liquid is harmless to humans. The police have been spraying liquid tear gas above the Ssangyong Motors paint shop where unionists are currently on strike.